Scored a smokepole turkey and tagged out in Nebraska! 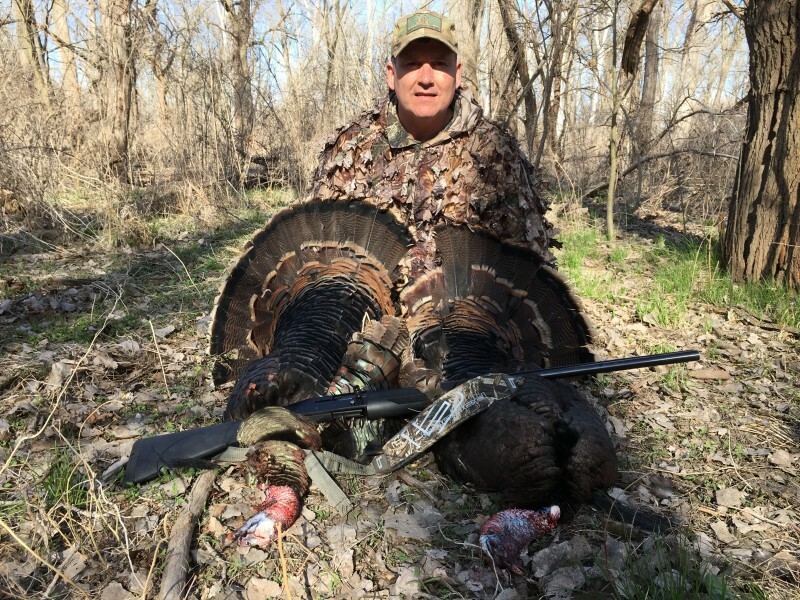 I've been itching to fill my final Nebraska turkey tag with my 20 GA Tennessee Valley Muzzleloading flintlock fowler. So, I got together with a co-worker this morning and we took his boat to some remote public land. The area has a bunch of birds, but the walk-in accessible portion gets a decent amount of pressure. The back side - only easily accessible by boat - sees virtually no pressure. Going to this side would make for an excellent hunt. My hunting partner started off calling for me and did a fine job. With my decoys out in front of us and the bird distracted by his rubber lover, he ultimately lured this bird into just 20 yards, the sweet spot for my 20 GA fowler. It goes without saying that 70 gr. of Goex FFg authentic black powder and 1+1/8 oz. of # 7.5 shot at that range was instantly lethal. This bird was a "tween": he had a stub beard, spurs that were only 3/8" long and the last set of his fan feathers were not quite even with the rest. It made no difference - I was extremely happy to have finally put a turkey down with this gorgeous gun. 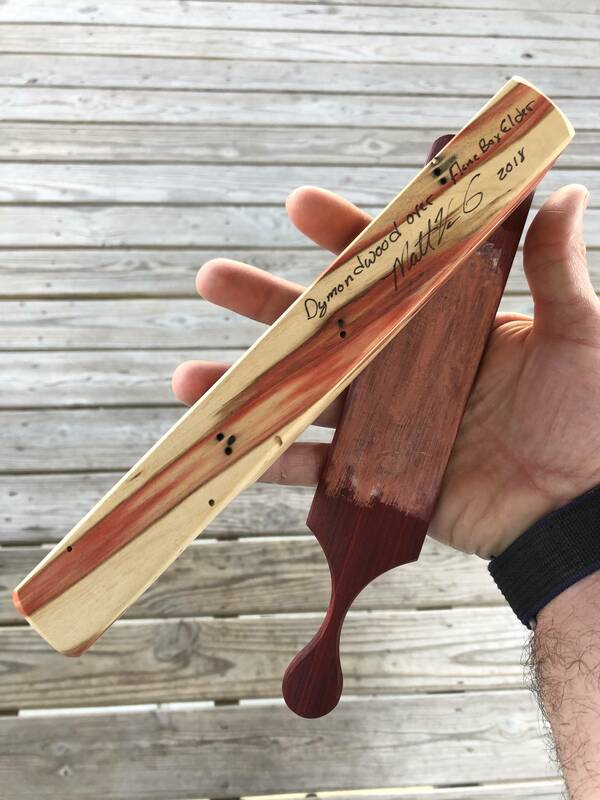 A few minutes after we collected my bird and let the woods settle, I jumped on my new Matt van Cise custom box call to try and return the favor for my co-worker. We moved away from our spot by only about 50 yards when my calling was answered by some very distant birds. We decided that we had a great spot where I had just shot my bird, with lots of shooting lanes, so it only made sense to fall back and call these new birds right back there. I took my dead bird and faced him toward the approaching gobbles. Then I took a stick and leaned it in his fan to prop it up in order to use him as a strutter to accompany my inflatable Avian-X breeder hen decoy. It worked like a charm. For the first time ever, my calls actually out-worked a real hen who was trying to lure the inbound bachelor group to her! 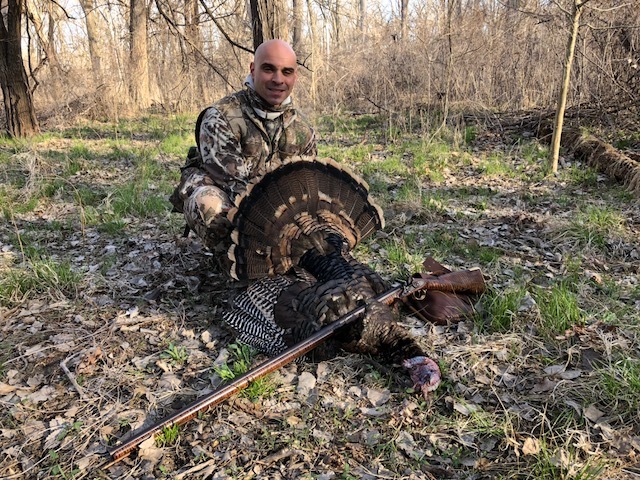 After a long wait, the gobblers showed up inside of 25 yards, and my buddy laid the smack down, killing not one, but TWO mature birds with one shot, and filling his last two tags! It was an amazing day. We were both completely tagged out for the 2018 Nebraska Spring turkey season by 9 AM! Dang, you are having a good month, the twofer is pretty cool also, your kids are going to be tired of turkey for dinner! 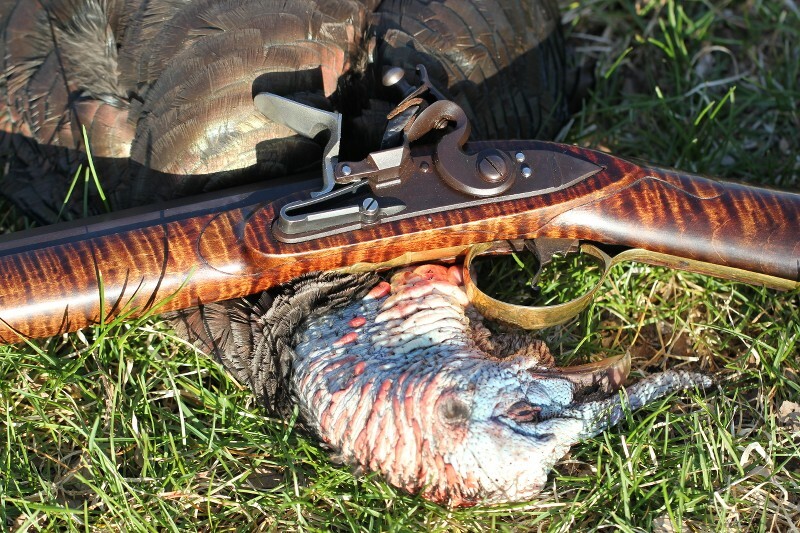 Good looking gun, good looking turkey. Your gun is a lefty? You should post this on the muzzle loading forums. This has been - no joke - my best turkey season ever (and I may not be done). There's so much meat in the chest freezer already that I HAVE to cook some tonight. You ain't kiddin! Killing one of these birds is hard enough. Doing it with a flinter and diminishing your max range to 25-28 yards with no choke/small shot is a true achievement. I was damned proud of this bird. No, sir. No flash. I put a fresh flint on this morning before I left just to be sure that spark would be stout. Flints are too cheap to try and stretch an old one into a hunt. Yes, indeed - this gun is a lefty. I did post this one on a PA hunting forum in their traditional section. Those guys love seeing stuff come together with traditional smokepoles. That turkey has got more hair than you! Thanks, Paul! This was one heck of a fun hunt. Once again, nicely done. Can't help but drool a little bit when I see that smooth bore. Congrats on another well executed hunt. Man, y'all make a great team. Three Toms in a short spell. Great calling and shooting. And that Smoke poll has some really nice wood. Only problem the lock seems to be mislocated! I can honestly say that, months after the purchase, there are no regrets on paying a little more for that gun. It's one of those things that brings a smile to your face every time you see it in the safe. He and I had never hunted together before yesterday. He did an excellent job calling for me, and he expressed the same feeling about my work on the call. We both came away with pretty big admiration for each other's abilities after this one. We talked about the stuff that we learned from each other on this particular morning and that this is something we will definitely be doing again next season. I guess it would be appropriate to show off that Matt van Cise call that called in those 4 Toms, while we’re discussing this hunt. 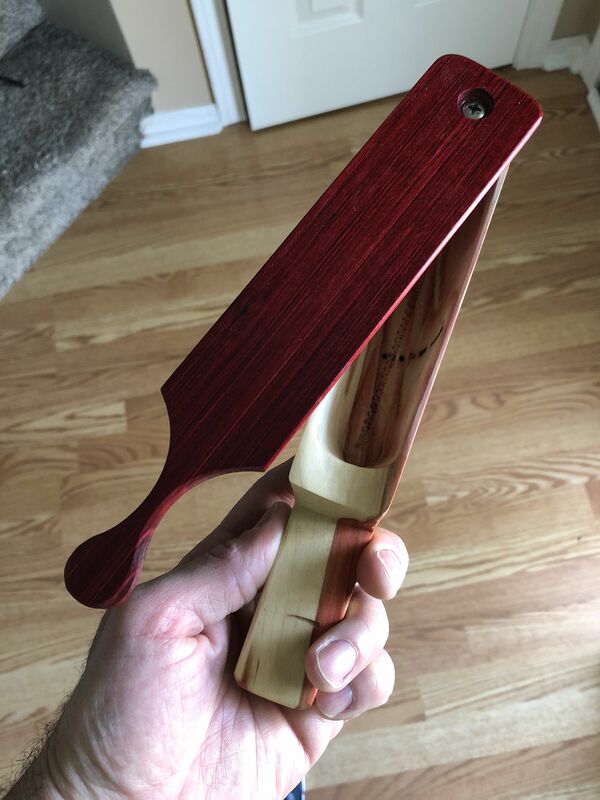 Matt makes custom, lather-turned strikers and custom box calls that look and sound great. While he makes a bunch of wood combinations for his boxes, this particular call is a combination of dymondwood and flame box elder that features a cool, pink figure through it. It has a ton of volume and great pitch control. Believe me, one of my favorite things to do when I pop this gun out of the safe is simply look at it. There's times when you simply know you've made a great investment, and this gun represents one of those times. It shoots true with both shot and round balls, and looks great to boot. This was our first time ever hunting together. I was very impressed with his calling, and he expressed the same feeling about mine. Getting 5 birds total to come into our setup - the majority of which came in after one bird was already killed in the same spot - tells us that we definitely did something right. Both of us learned things from each other yesterday and that's always a good thing. I don't think there's any question that we'll be hunting together again next season. Once again Awesome hunt. 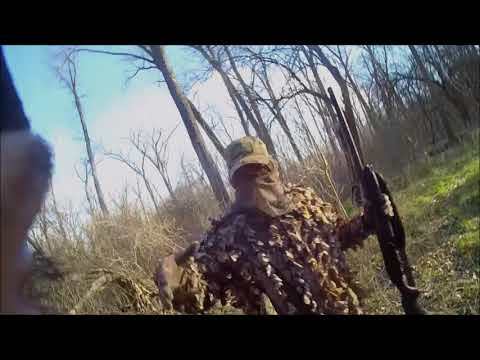 And I thought hunting turkeys with a modern shotgun was difficult. You rocked it with a smokepole! And your partner getting two with one trigger pull has me shaking my head. Thanks, Diver - yeah, he lined those two up perfectly. It helped that they had to pass through a brush funnel to get to us, so much so that he had to give them a second to separate before he shot to avoid hitting more than the two he was legal to take. The execution for his kill (s) could not have gone better, he made a perfect shot and that was the furthest out I believe that I've ever called a bird in from, let alone an entire bachelor flock. 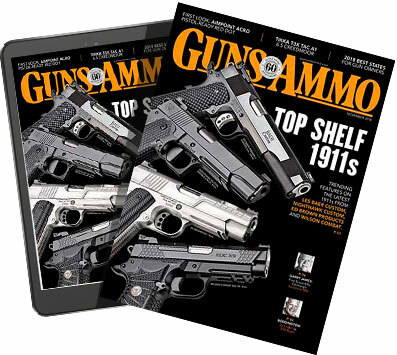 Every time I see pics of that gun I have to wipe drool off my iPad. Great hunt brother! We need to get you out to Nebraska so you can check it out in person, buddy! Thanks!! This was a major box check. Thanks, Robin! Agreed about getting game with the BP firearms. It's a different game altogether.